An In-Depth Exploration Of Dynamic Flatpicking. Dan Crary imparts a wealth of knowledge, encouragement, inspiration and ideas that will benefit all guitar students. 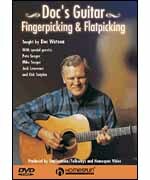 Includes instruction on numerous runs, syncopated licks, crosspicking and more.85-MINUTE DVD INCLUDES MUSIC + TAB LEVEL 3.